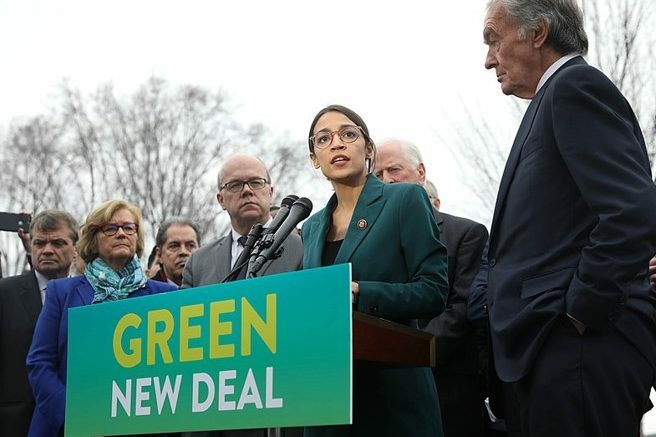 Representative Alexandria Ocasio-Cortez (center) speaks on the Green New Deal with Senator Ed Markey (right) in front of the Capitol Building in February 2019. Original photo by Senate Democrats. Loudonville, NY. Representative Alexandria Ocasio-Cortez has a positive 52-33 percent favorability rating among voters of her district nearly three months into her first term in Congress, and 48 percent of all voters and 61 percent of Democrats would vote to re-elect Ocasio-Cortez in 2020 while 39 percent would prefer someone else, according to a new Siena College poll of New York CD 14 registered voters released today. Fifty-seven percent of CD 14 voters think it was bad for New York that Amazon cancelled its plans to build a new headquarters in Queens while 32 percent say it was good for New York, and by 58-35 percent, voters in CD 14, which includes sections of both Queens and the Bronx, support Governor Cuomo’s efforts to woo Amazon to reconsider its decision. When it comes to politics, only 25 percent of voters in Ocasio-Cortez’s district would describe themselves as a Democratic Socialist while 70 percent prefer describing themselves in ‘some other way.’ Still, overwhelming majorities are in favor of Medicare for all, free tuition at public universities across the country, a federal guarantee of a job that pays a living wage, banning assault weapons and taxing incomes above $10 million at rates of 60 percent or more. 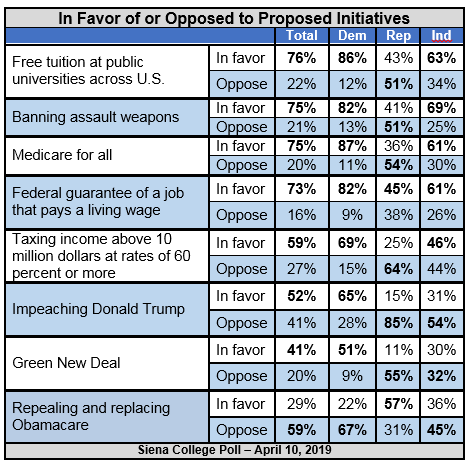 The Green New Deal garners the support of 41 percent of Ocasio-Cortez’s constituents with 20 opposed and 38 percent indicating that they don’t know enough about it. A majority of her constituents, 52 percent have a favorable opinion of Representative Ocasio-Cortez while 33 percent view her unfavorably. Two-thirds of Democrats view her favorably while nearly three-quarters of Republicans have an unfavorable view of Ocasio-Cortez. Overall, Ocasio-Cortez has a positive 47-42 percent job approval rating with Democrats grading her at 59-32 percent and Republicans at 17-74 percent. Nearly half of all voters, 48 percent, and 61 percent of Democrats are prepared at this point to re-elect Ocasio-Cortez, while 39 percent of all voters, 78 percent of Republicans, but only 27 percent of Democrats prefer someone else. “AOC has jumped onto the front pages and certainly has attained household name status in her district,” Levy said. “Nearly two-thirds say that they are following the coverage of their freshman representative closely and while only one in seven have no opinion about her, favorable or unfavorable, Joe Crowley after 10 terms remains unknown to nearly 40 percent of voters. “Fifty-nine percent of voters say that they are proud to have Ocasio-Cortez representing the district and 61 percent agree that while many of her ideas on the economy, climate or healthcare may not become law soon, they think she is moving us towards a more fair and just society,” Levy said. “The district breaks with Ocasio-Cortez on the Amazon deal. Fifty-seven percent say that Amazon canceling was bad for New York and 58 percent would like the deal revived. Even in the Queens area of the district, over half say losing the deal was bad and 54 percent would like it revived,” Levy said. 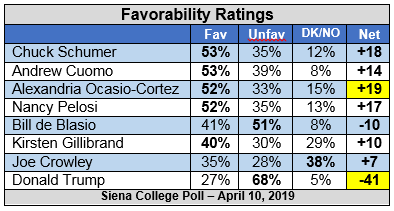 In CD 14 among eight high profile politicians, Ocasio-Cortez has the highest net favorability rating at plus 19 followed closely by Senator Chuck Schumer at 18 and House Speaker Nancy Pelosi at plus 17. Former CD 14 Representative Joe Crowley at 35-28-38 has a plus 7 rating and President Donald Trump has a negative 41 favorability rating in this heavily Democratic district. 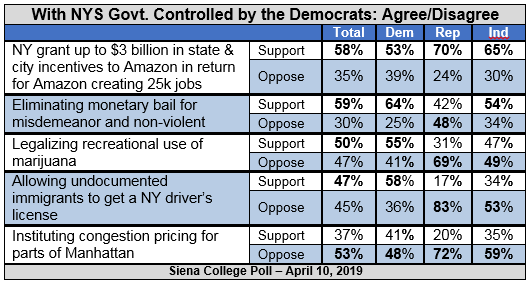 This Siena College Poll of NY 14 was conducted March 31- April 4, 2019 by telephone calls conducted in English and Spanish to 607 New York CD 14 registered voters. Respondent sampling was initiated by asking for the youngest male in the household. It has an overall margin of error of +/- 4.3 percentage points including the design effects resulting from weighting. Sampling was conducted via a stratified dual frame probability sample of landline and cell phone telephone numbers (both L-2 Voter file) from within New York CD 14. Data was statistically adjusted by age, party by county, race/ethnicity by county, and gender to ensure representativeness. The Siena College Research Institute, directed by Donald Levy, Ph.D., conducts political, economic, social and cultural research primarily in NYS. SCRI, an independent, non-partisan research institute, subscribes to the American Association of Public Opinion Research Code of Professional Ethics and Practices. For more information, call Don Levy at (518) 783-2901 or (518) 944-0482. For survey cross-tabs: www.Siena.edu/SCRI/SNY. Be the first to comment on "Ocasio-Cortez Viewed Favorably by Majority of Voters in Her District"